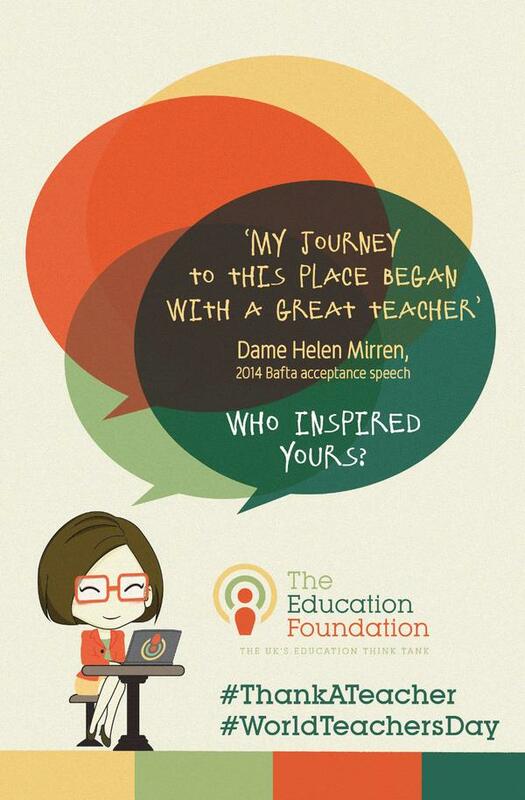 5th October – World Teacher Day! I do like an occasional moan about work (ahem); overwhelming workload, confused communication and the grim reality of choices that have to be made in times of austerity and finite resources. However, I remain extremely proud of my profession and the positive, life-changing impact we can have on young peoples lives. (I think the reverse can be true but I will save that for another post.) As World Teacher Day approaches (who knew? ), it seems timely for me to join in with the chorus of appreciation for my own teachers who inspired me in the past and those who I have worked with and work with every day who make a difference to me. From my own secondary school, I need to thank Mr Young, my drama teacher for his unshakeable belief in me and what I could do and that it is ok to be different. From CWC, I need to name check Hilary Matthews, Chris Curran, Marie Mcadam, Alex Yates, Jez Taylor, Max Morton, Phil Bunce, Nicole, Clare Reilly, Ita Leavy, Des Reardon. From Harris, I would like to doth my cap in eternal gratitude to Laura Turner (Nicholls), Kirsty Martin, Sarah Newman, Ashley Harold, Nikki Pelletier, Sarah Murray Thompson, Debbie Peel, Charlotte Tatum. Clare Marks and Kate Atwell. And finally, from my current family Vic, Vanessa, Manisha, Aimee, Sarah Mac – thanks for the continued inspiration. Let’s change the debate about our profession. We really do make a difference.